A lot can happen in 25 years. Just ask New Belgium Brewing, which has risen to become the country’s fourth largest craft beer producer (and eighth largest brewery overall), led by the flagship Fat Tire Amber Ale. The beer is so ubiquitous that some ever-argumentative types debate if it’s too big to be considered craft anymore. 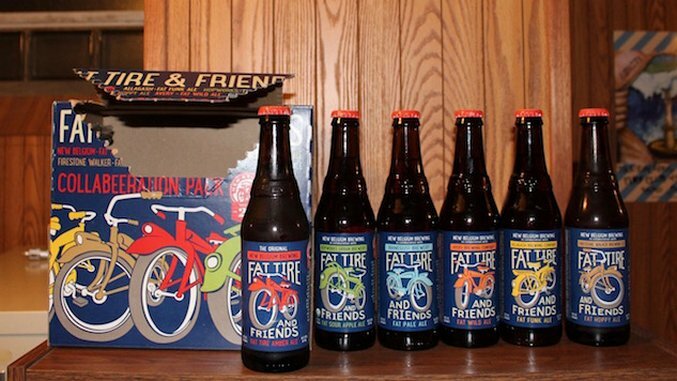 A silly discussion and one we’ll avoid, especially given how New Belgium is celebrating their anniversary: turning the recipe over to friends for a collaborative remix sampler pack with five hot breweries from across the country. To keep the analogy going, the new beers here reimagine and add new twists, mostly paying homage instead of being “by the book” remakes. Like most cover songs, these beers ultimately lead the drinker back to the original for both familiarity and with a renewed appreciation for the quality that’s made such an impact. Here are impressions on the Allagash, Avery, Firestone Walker, Hopworks Urban Brewery, and Rhinegeist versions, listed in order of enjoyment. Not funky bacteria, but funky spices coming from a house yeast strain that bubbles with orange peel, banana, coriander, cardamom, black pepper, and perhaps some baking spice. The front of the beer is pure Belgian farmhouse, but as the flavor progresses, the original Fat Tire’s amber sweetness shines through in counter flavor. It’s an interesting transition that works wonderfully. Dry and playful to start, it gives way to a sweet moment that washes most, but not quite all, the spice away with a flavorful finish accented by a Brett note. It would play well with a holiday dinner. It’s also a reverse experience from the rest of the Friends pack, where others tend to start with the amber note and build complexity atop. Pouring a dark gold in color with a nice foamy head, this pale ale also highlights the hops of 2016 with a mandarin-mango-papaya dominance. It’s smooth and perfectly carbonated, which allows the original’s malt familiarity to shine in combination with the new fruity hop characteristics. A Belgian yeast gives nuanced complexity and then it finishes with a hint of bitter lemon. With a light body that’s a tad oily in mouthfeel, Fat Pale Ale is that rare cover that feels both unique but fully in tune with the original. The names in this pack don’t lie, as this take is hop forward to the extreme, as they said back in 1991 when New Belgium introduced the less hoppy original. Firestone Walker’s take is Mosaic, Citra, and Mandarina Bavaria all the way, three it hops that give a juicy and tropical flavor mid-body. It starts with a shadow of the familiar amber malt profile before the new version ramps up the tropical. This version is perfect for the summer and would go great with Mexican food. It keeps the original flavor profile present, though understated, letting today’s hop crop take the spotlight in a 6.0% pale ale. Avery makes some lovely wild ales that stand on their own. As the only Colorado brewery in the series, there’s a high expectation that New Belgium’s closest geographic partner would do something special. This one comes out mild and soft. At heart it’s Fat Tire amber ale—perhaps the most recognizable use of the base ingredients of the pack—but with an earthy Brett strain that adds layers of grass, straw, and fermented pineapple. There’s a tropical mango under-note in the profile while a potent pineapple commands both the aroma and the after taste. A “play that funky music” take on the original, Hopworks adds Lactobacillus and apple juice to the remix. This is a light sour with an earthly layer, more tart than sour. Consider the style a wild pale ale with a bit of barnyard funk up front, a mild Granny Smith or crab apple body, and a lingering bready taste at the end. On first sip the name delivers more apple flavor than the actual sensory experience, but its sweet-sour contrast of the apple grows with time and takes a balanced candy green apple flavor by the end of the bottle.